Shown in Apache Gold Laminate -Ruger 10/22 & .920" Barrel, 99% inlet for a "Press-Fit"
You’ll really enjoy shooting your rifle when its equipped with one of our New Tack-Driver Silhouette stocks with its custom styling and conforming grip for added comfort and shooter accuracy. 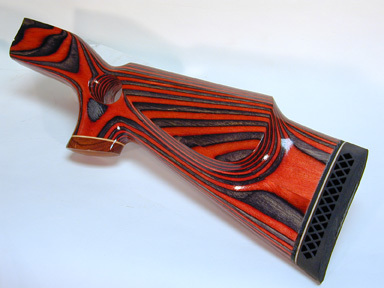 The design of the grip was inspired by Offhand European competition air-rifles, while the proper amount of cant and cast-off typical of traditional American rifle designs have been utilized as well. It’s really the “Best of Both Worlds!” Designed for use on or off the bench, it comes with a 2-1/4” Wide Forearm, and has a flat palm pad for that offhand shot that counts. The Tack-Driver’s dimensions conform to NRA Silhouette rules, and in laminated wood, it weighs the same as other leading thumbhole silhouette stocks on the market. Whether you are a competition shooter or just plinking around, you will be delighted with the Tack-Driver’s good looks, comfort & handling, and enhanced scores! These "No Cost" options are available to Mix & Match as you please, with the "Tack-Driver" Silhouette. Select a Laminate Color in the pricing tables. Your stock can be inletted for any of the actions listed in our Available Actions Section. CLICK here for the list. There is no extra charge unless specified in the available actions section for rare models. NOTE: If paying by Credit Card, the charge will be processed approximately two weeks prior to shipment. The AVERAGE Approximate Production Time is currently 6 to 8 weeks. For Custom Setups, Target Style Stocks, or stocks for actions in low demand, please allow approximately 8 to 10 weeks for production - See Available Actions Section for details. (Allow 1 extra week for shipping) For a Complete Discussion of Our Production Times, please see the Common Questions Section of this website.